When we hear the phrase “Namibian minerals” we think of all the great carbonates from Tsumeb, Erongo aquamarines and fluorites, amethyst from Brandberg—the list goes on and on. But out of all the holes dug in this vast country, we haven’t seen all the unusual treasures Namibia has to offer. For instance, in the last year or so we have seen some new twists on some old favorite species from the Erongo region. 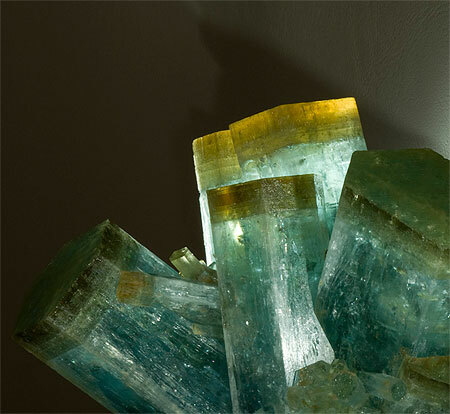 First we look at a heliodor-capped aquamarine cluster with big cigar-sized crystals. The center crystal is actually doubly terminated. Most faces and terminations are glassy and pristine. 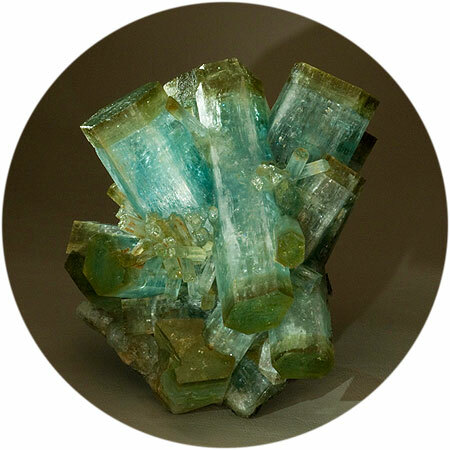 This specimen comes to us from Erongo, where most of the crystals with this unusual color scheme were limited to single crystals and miniature clusters. This specimen is most likely one of the largest produced from the area. 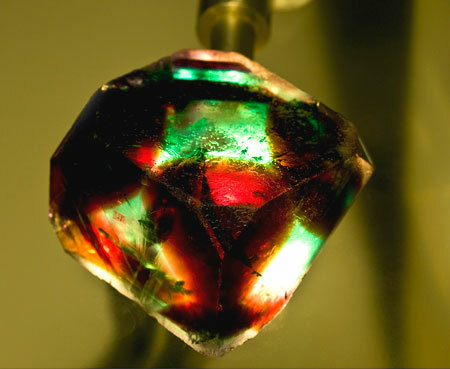 Second is an alien-like fluorite cube with spooky green and red banding, creating phantoms. A limited number of these fluorites were found in Erongo from the appropriately named “alien pocket.” The material is very dark and only comes to life with bright transmitted light. The photograph above shows the fiber-optic light converging underneath the fluorite to accentuate the color and mask-like patterns. Several new alien-fluorite pieces will be available for sale; call or email us to inquire. Pala International acquired the Rhoda and Dan Brock collection recently with the help of Casey and Jane Jones. At first glance the collection seemed like a pile of rocks left in a box in the garage, but upon closer inspection there were definitely some hidden jewels to be dusted off and examined: menagerie of local specimens from around San Diego County and into Mexico. Included are a few nice benitoites, cuprites, calcites, and several varietals of quartz. Dan and Rhoda Brock began collecting minerals together shortly after their marriage in 1948 and collected until 1986 when they moved to Apple Valley, California. Sitting in Rhoda Brock’s collection room, a mineral specimen in her hand, becomes a touchstone for a story, many of them about her husband Dan who passed away in 1996. 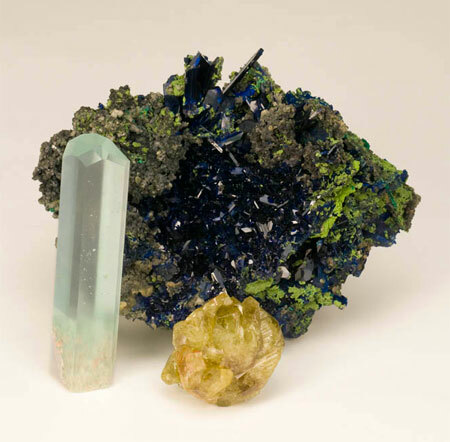 The breadth of their collection of minerals and gemstones exhibits more than their individual tastes; it also displays the extraordinary minerals that were coming out especially in the 1940s and 1950s. Rhoda and Dan were members of the Compton Gem and Mineral Club, California Federation of Mineralogical Societies. Dan Brock was chairman in 1957 when Compton hosted the CFMS show, and the first year the Smithsonian Institution exhibited minerals at a CFMS show. Rhoda displayed and competed at the CFMS shows; however, her memories and stories are of being in the field and collecting with friends and of the exhilaration a new find. They spent quite a bit of time digging on the dumps of the old Pala mines—beautiful specimens of kunzite, elbaite, and rubellite; and watermelon tourmalines that were discarded because they just weren’t up to the standards of the day. 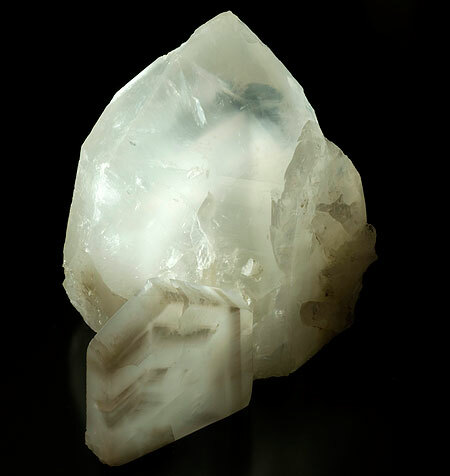 The best story, though, is of the extraordinary cat’s eye quartz find by Rhoda that was credited to her husband, Dan. 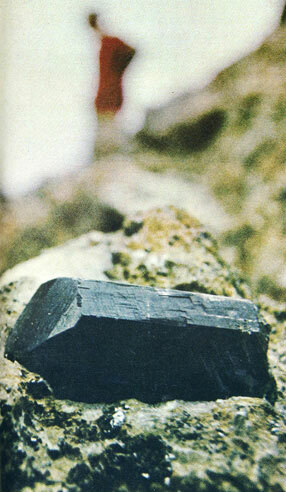 John Sinkankas, in Gemstones of North America, credits Dan Brock with a new and significant find of chatoyant quartz in Arizona, which he describes in the following way: “The author can recall of no chatoyant quartz from any locality in the world in which the inclusions are so fine and so brilliantly reflective.” (Sinkankas, 1959, p. 375) The problem is that Rhoda found the pocket! Here’s the tale: In 1956, friends from the Compton Club were collecting at the well-known Crystal Peak quartz locality in Yuma County. Dan and the others were hiking and scouting the hills above while Rhoda stayed in the “gully.” There was a little seam showing, so Rhoda started picking at it and digging with her Estwing hammer. Less than a foot under the surface a pocket opened up with lots of loose crystals in it. Later, when Dan showed some of the material to John Sinkankas, he assumed it was Dan that had found it. The last time Rhoda saw Sinkankas in Tucson in the late 1990s she joked with him about this—they perhaps agreed it was the way things were done back then. Pala’s Bill Larson recalls the following regarding another treasure unearthed by the Brocks. I was lucky to meet the famous John Sinkankas as a young collector of 14. 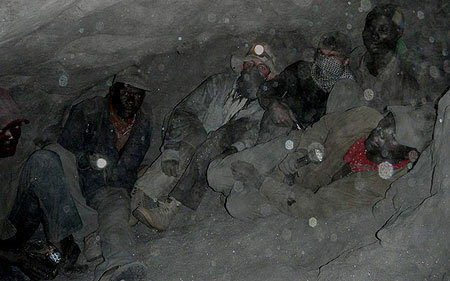 He led a small group of field collectors to Cecil Coles’s Benitoite Gem Mine, and he became a lifelong friend. 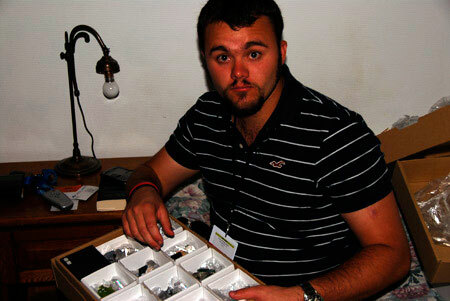 John was indispensable in helping Pala International locate tourmaline pockets in the various mines we worked. 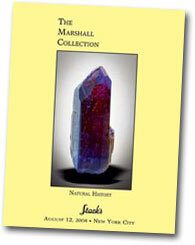 John chose me to purchase a major portion of his personal mineral collection in the 1970s. Then in the 1990s he called me and said, “You know Bill to be a well rounded collector you have to have a good library.” I had about 350 books at the time, and he sold me over 500 books from his personal library. Now I can only thank him as I have about 1500 books on gems and minerals, mostly prior to 1920, since I also listened to the late Curtis Schuh. 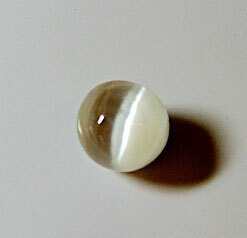 Eventually John chose Pala International to sell a fine selection of his gemstones and I kept, among several rare items, the cat’s eye quartz pictured above. The folks at BlueCap Productions have a production in the works: filming blue-capped kids exploring the world-famous mines of the Pala mining district. The idea grew out of interaction with young folk at this year’s Tucson show, when the kids discussed their budding passion for minerals. We are pleased to announce that we will be sharing display space with our good friends, the Gobin brothers (who we recently visited at the Sainte-Marie show). Pala will be bringing a selection of our finest colored stones and a collection of exquisite gem crystal specimens. 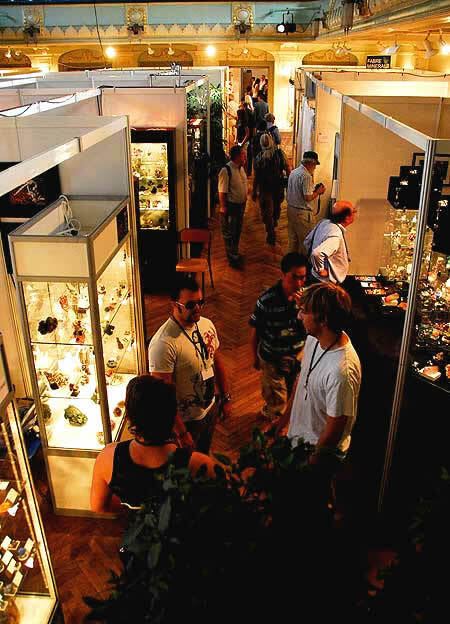 For more information visit the International Gem Show website. 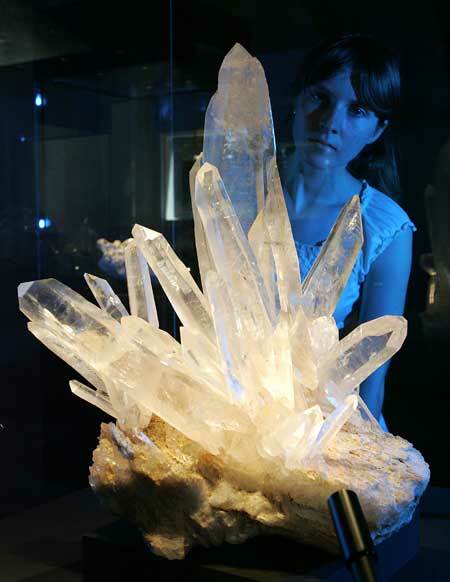 Mineral enthusiasts will have six days to view a remarkable exhibition of specimens later this month. 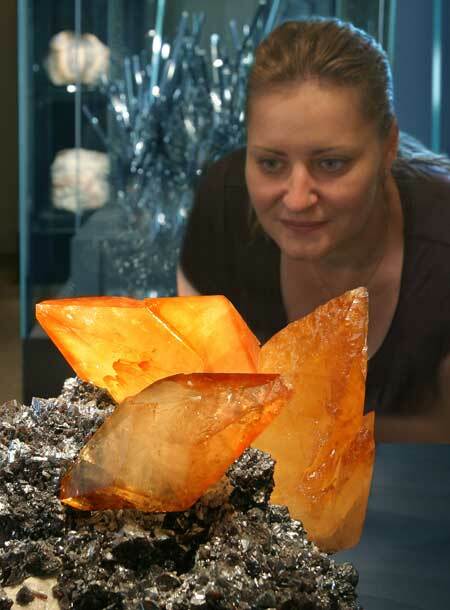 “terra mineralia,” which is to be mounted by the famous Technical University of Freiberg in Saxony, “presents for the first time the world’s largest private mineral collection of Swiss foundress Dr. Erika Pohl Ströher,” according to an exhibition press release (in German). The collection, amassed over 60 years of collecting, will be on permanent loan in Germany due to the efforts of Prof. Georg Unland, currently Minister of Finance of Saxony. 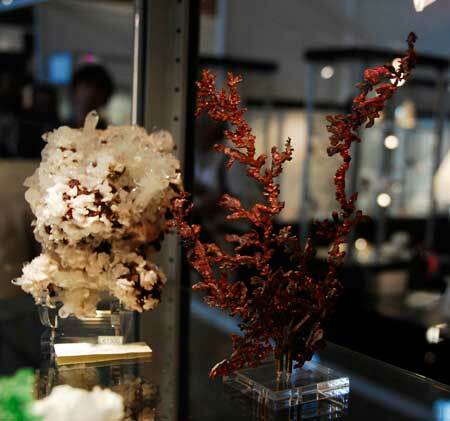 More than 5,000 minerals, jewels, and meteorites will be displayed in what organizers are calling “a mineralogical voyage around the world.” Indeed, four continent halls—Africa, Europe, America, and Asia—are being filled with over 140 custom-built showcases. Two thirds of the specimens in the exhibition will have no duplicate on display, according to an August 1 press release. 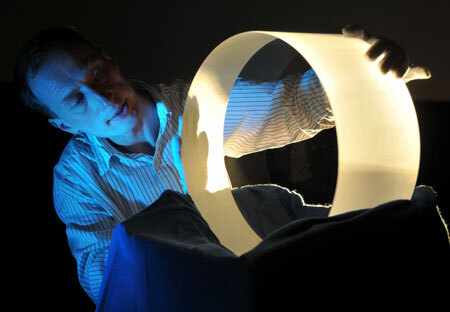 Also on display will be a 100-kilogram synthetic, “water-clear” fluorite crystal, created by Schott Lithotec, a developer and supplier of optical components used in lithography technology. The show will include a 3.5-ton meteor exhibit from what is presumed to be the largest impact crater at Vredefort in South Africa. Eight plates of polished “friction-melted” earth from the crater will be on display. For more splendid specimen photos see this Spiegel Online article (translated by Google; original German here). Since June, BlueCap Productions has offered footage online from this year’s Tucson show—a free supplement to the DVD, What’s Hot In Tucson. 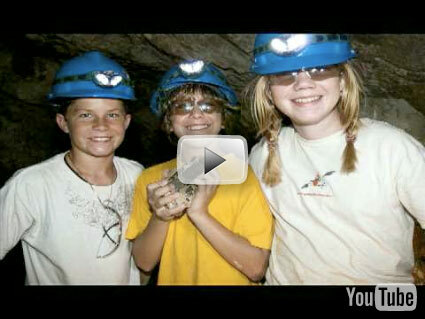 Due to the popularity of this material, BlueCap has collected the footage into a new DVD, What’s Hot In Tucson: Online. This new DVD also includes two segments not offered online. The new DVD is offered separately, or free to new buyers of the 2008 What’s Hot In Tucson DVD. This month we feature a couple more highlights from the recently acquired Gabriel Risse collection. These specimens reflect Risse’s keen appreciation of artistic form, rare composition, and striking contrasts of tone and hue. 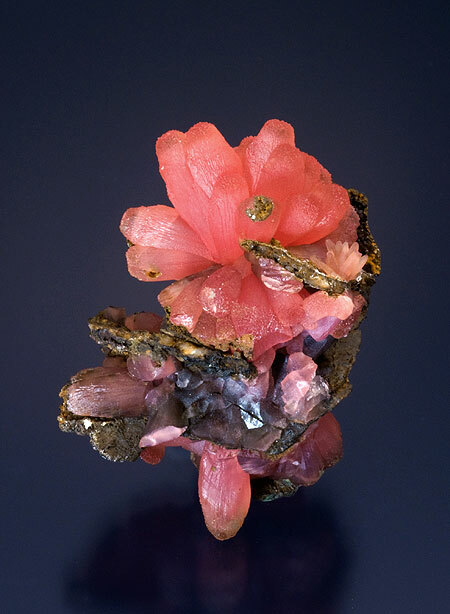 The first specimen is an unusual combination of willemite and hemimorphite on matrix. 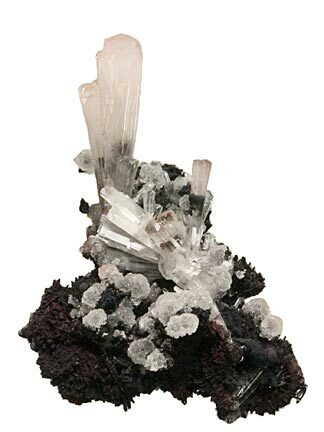 This specimen comes to us from the Potosí Mine near Santa Eulalia in the state of Chihuahua, Mexico. The hemimorphite’s long, slender prismatic crystals contrast in form to the botryoidal crystals of the willemite with their druzy-like surface. A true sculpture by Mother Earth featuring dark earthy tones of black and brown mixed with lustrous white crystals with just a touch of pink. 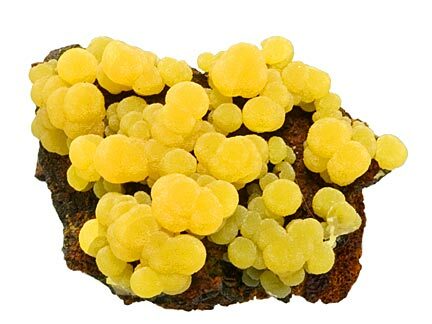 The second specimen jumps out at you with bright yellow botryoidal mimetite crystals splashed on brown limonite matrix. This mimetite was found in San Pedro Corralitos, in the state of Chihuahua, Mexico. The separation of the mimetite allows the matrix to create a nice contrast, defining the robust form of the mimetite crystals. 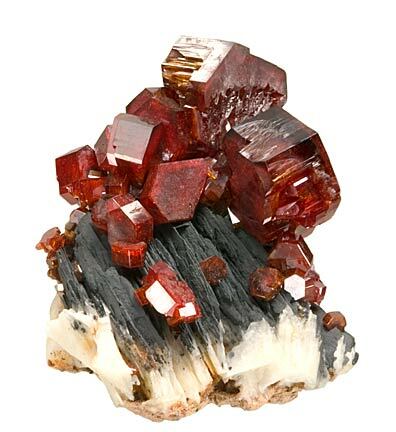 The third featured item is a very aesthetic specimen with large vanadinite crystals perched on top of a barite matrix. 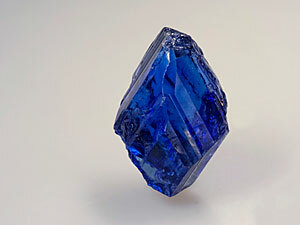 This specimen is from the ACF mine in Mibladen, Morocco. 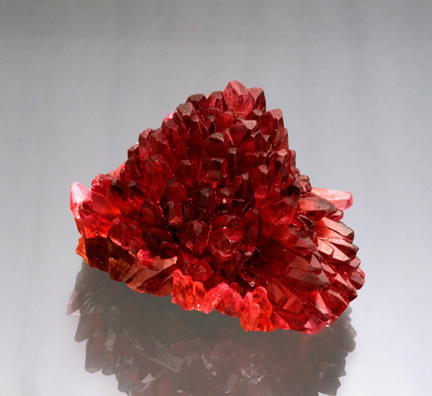 The tabular vanadinite crystals range from 20 mm. to 2 mm., with larger ones taking on some etched and hoppered faces. The vanadinite clusters are sprinkled on top of crested parallel blades of charcoal gray barite with a white base. Stay tuned for more from the Risse collection or call in inquire about what’s still available. 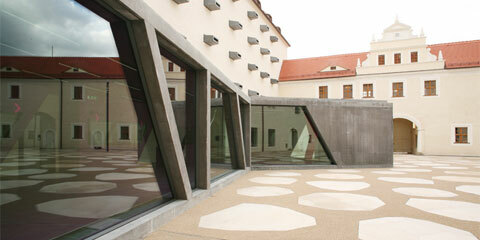 View more from the Risse collection. 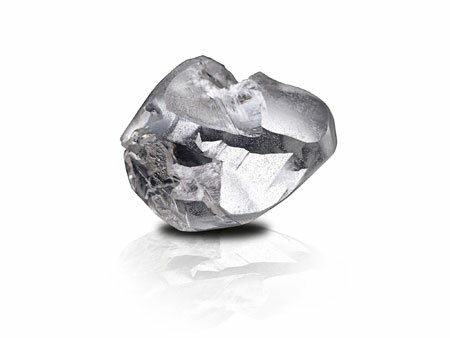 On September 8th a 478-carat rough diamond crystal was discovered in the southern African kingdom of Lesotho. 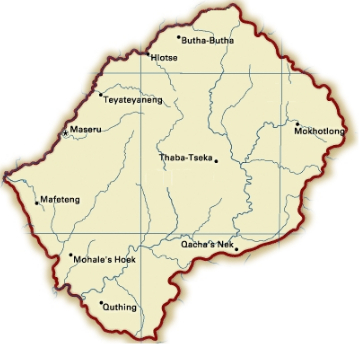 The diamond was unearthed at the Letseng Mine in the eastern Mokhotlong district of the tiny country, which lies completely within the boundaries of the Republic of South Africa. The Letseng mine has a rich history of oversized diamonds being pulled from its depths. Since 1920, four of the twenty largest rough diamond recorded have been found at the Letseng mine. It also has been one of the most productive mines throughout its history. 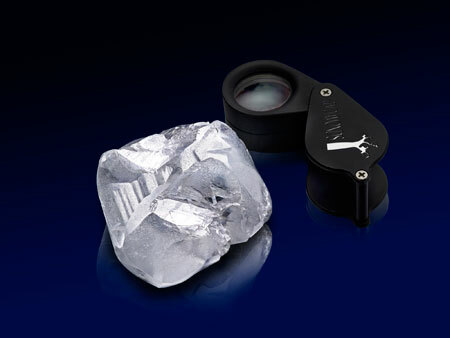 This new diamond rough has a chance to set a world record for the finest-quality cut diamond over 100 carats. The color and clarity have been analyzed, revealing a possibility of having a 100-carat-plus D flawless gem. We will have to wait see what the final faceted stone actually yields. 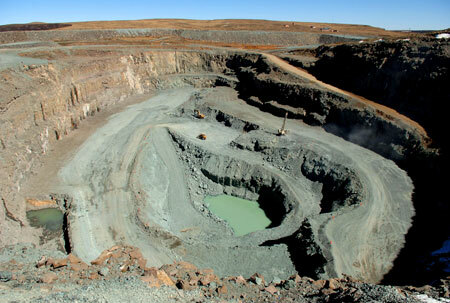 The Letseng mine is operated by Gem Diamonds in a partnership with the Lesotho government. It suspended production after De Beers withdrew in 1982. 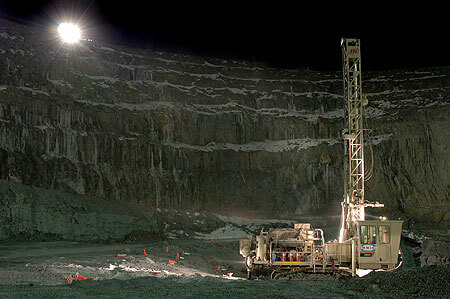 The current operator, Gem Diamonds, acquired the mine in 2006, after it had reopened in 2004 under management by JCI. A Gem Diamonds press release about the unnamed 478-carat rough states that the mine is expected to yield for another 45 years. 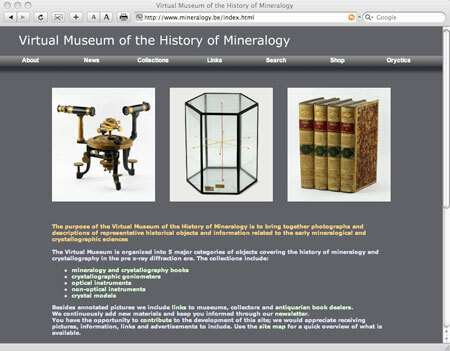 Topics include antiquarian mineralogy and crystallography books, publications and manuscripts, crystallographic goniometers and other antique crystallographic and mineralogical instruments, crystal models, and anything else related to the history of these sciences. 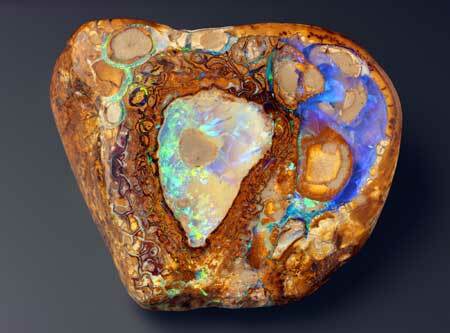 Pala International will be at the Colorado Mineral & Fossil Show. Where: Holiday Inn Denver–Central, 4849 Bannock St. Wed.–Sat. : 10 a.m.– 6 p.m. Sun. : 10 a.m.– 5 p.m.
We look forward to seeing our many friends there. For more information visit the show website. 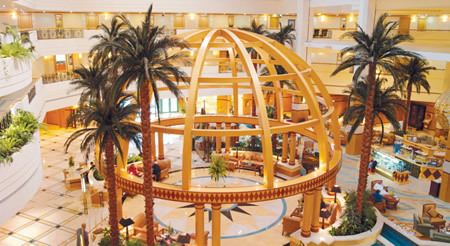 Visit the Pala International Show Schedule for future events. 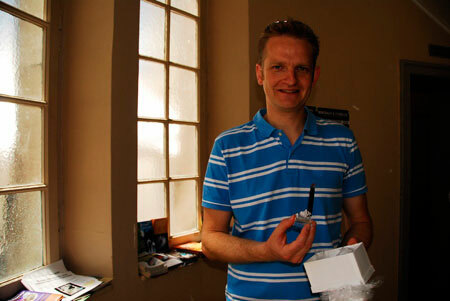 It was June 2008 and time for Bill Larson’s favorite European show, Sainte-Marie-aux-Mines. This year they were a group of five men—Bill, his two sons Will and Carl, friend Ben Sobczak, and Bill’s friend and fellow gem dealer Mark Kaufman. A “great green fluorite from Namibia…on a large quartz that has color-center phantoms—truly superb and new to my eyes"
Next Tuesday, August 12, the New York numismatic auction house Stack’s will feature the sale of The Marshall Collection, the result of a 64-year passion that grew to 4,000 specimens, according to the sale catalog. 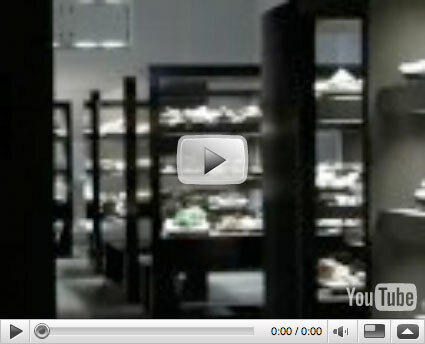 The collection includes over 700 lots of minerals, gemstones, meteorites, fossils, decorative arts, and more. Featured in the sale are several pyromorphites, which according to the catalog, were especially close to the heart of the 77-year-old collector since stumbling upon the species in a mine dump near Philadelphia. This month we feature three new specimens from the new Gabriel Risse collection acquired by the Larson boys at this year’s Sainte-Marie-aux-Mines show in France. The first piece is a superb miniature pyromorphite specimen from the Bunker Hill Mine in Kellogg, Idaho. Classic rounded barrel hopper crystals with cavernous centers. 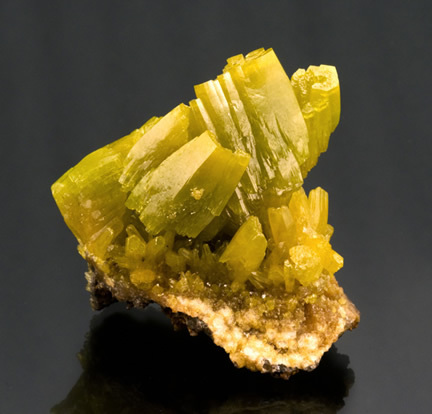 Vivid greenish yellow color with one main crystal surrounded by various size intersecting crystals. This is a specimen you just keep spinning in your hand to see all the great angles and details. The second piece is a completely unique tourmaline on quartz from Paprok, Afghanistan. 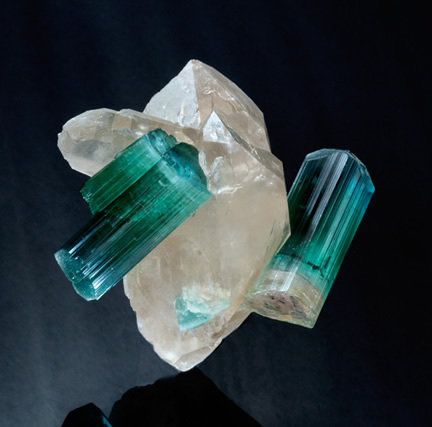 The two tourmaline crystals are so gemmy, with a neon greenish-blue hue, that it would make any cutter drool with temptation. One crystal is doubly terminated with a subtle gradation from bluish green to greenish blue with a frosted pyramidal cap. 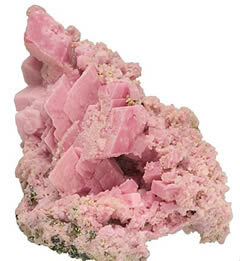 The other crystal is thicker with a cleaved pink-and-white bottom and an upper half that is virtually flawless. If that weren’t enough, the two beautiful tourmalines are naturally attached to a doubly terminated quartz crystal. Bill Larson recalls meeting Gabriel Risse twenty years ago when Risse was a ripening 18-year-old mineral collector in Europe. Their sporadic relationship over the decades culminated at this year’s Sainte-Marie-aux-Mines show in France. Since those early days of collecting, Gabriel had amassed an exquisite mineral collection with over 150 pieces, mostly in the small cabinet to miniature sizes—all beautifully representing the best formations and aesthetics from most of the great localities around the globe. From gem crystals to metals to carbonates, this full-spectrum collection seems to focus on crystal perfection, unique morphology, and artistic form. The collection encompasses many species and highlights fine examples within each category: pyromorphite from Idaho to vanadinite from Morocco…calcite from Sweden to rhodochrosite from South Africa…tourmaline and kunzite from Afghanistan to epidote from Austria…aegirine from Malawi to hemimorphite with willemite from Malawi…carrolite from Congo to calcite from Kazakhstan…ilvaite from Russia to topaz from Pakistan. See this month’s featured specimens and Wimon Manorotkul’s FotogFocus for a sample. A venture through the Gabriel Risse collection is an in-depth and colorful ride through the realm of exquisite mineral specimens. 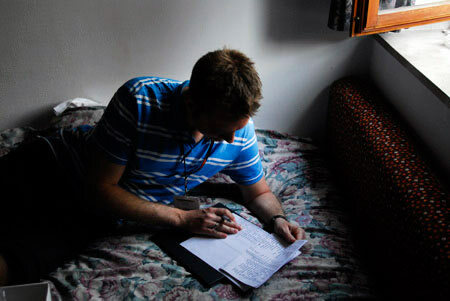 The deal went down in a hotel room in Sainte-Marie-aux-Mines. Bill hand-carried the thirty most fragile specimens back, and Gabriel took a special trip to San Diego, delivering the last 100 pieces, finalizing the deal, and checking out the Pala operations. A recent find at the Elizabeth R. mine, in the Pala mining district, revealed some spectacular kunzite crystals. The crystal formation is not very well defined but some of the pieces are facet-grade and hold a beautiful natural color. The color is verifiably natural since we can actually trace the kunzite directly from the mine. 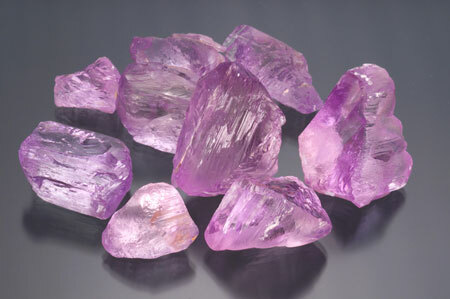 This batch of kunzite takes on an extremely intense purplish-pink hue. The condition of this material is slotted for a trip to the cutter. Stay tuned for some intense faceted kunzite to be produced from this rough. In April, we reported on miners trapped and killed in the mines of Tanzania’s Merelani mining district. Six months before this tragedy, an international group of adventurous gemologists and fellow travelers wiggled and wriggled down the rabbit holes of Merelani’s labyrinthian mines in Block D, which is operated by independent, artisanal miners. It is in D’s sister sector, Block B, where the miners perished due to seven days of torrential rain. Three rough pieces of zoisite rough being analyzed. 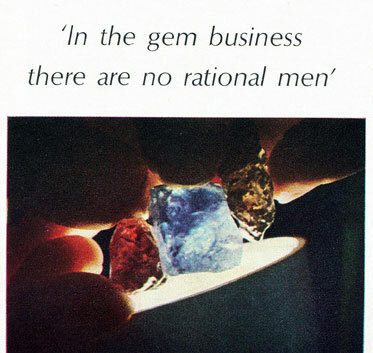 From an article published May 1969, at the time of tanzanite’s initial discovery. “Working the Blue Seam: The Tanzanite Mines of Merelani,” by Vincent Pardieu and Richard W. Hughes, with five other contributors, begins with the 40-year history of the mines in the Merelani hills that are situated in the shadows of Mount Kilimanjaro. The article discusses the science of this variety of the color-shifting species, zoisite, including the geology of region. Finally, the band of keffiyeh-clad cronies—dubbed “the insane gem posse”—shimmy down shafts that, with any luck, have blue at both ends. 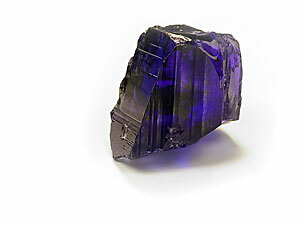 Stocky tanzanite crystal on matrix. I wonder where this piece ended up. From the May 1969 article. Title: Self-portrait with serviette. 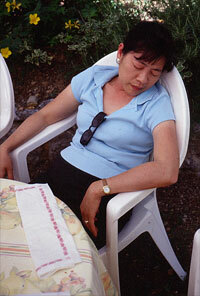 Wimon Manorotkul will get a well deserved rest when she leaves Pala International next month. 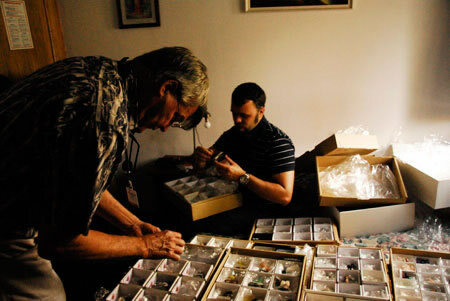 Wimon Manorotkul has been photographing gemstones and mineral specimens for Pala International ever since Richard W. Hughes developed Palagems.com, which debuted in late February 2000. At first the photographs simply filled a need: if you’re going to offer an online catalog, you better include photos of what you’re selling. So prior to the launch of Palagems.com, Wimon set about photographing the inventory. As a gemologist—she’s an FGA (elected to the Fellowship of the Gemmological Association of Great Britain)—enjoys gem testing and photomicrography. “I just love the aesthetic qualities of gemstones at high magnification,” she says. Now, after seven years of helping Pala clients in their quest for that perfect gemstone, Wimon Manorotkul is leaving Pala, and together with her husband Richard W. Hughes they are going home—to Wimon’s native Thailand, where the couple first met. We wish both of them all the best, but before she leaves us, we’re pleased to feature Wimon Manorotkul as the third artist in our occasional series, FotogFocus. In this installment of FotogFocus, we get to know Wimon a little better, but we also see the most recent efforts of her talent. Included are photographs, just taken, of selected specimens Bill Larson acquired at this year’s show at Sainte-Marie-aux-Mines, from the Gabriel Risse Collection: a lovely Peruvian selenite and the snail-like adamite from Mexico.